If you're a golf fan flying Southwest Airlines later today, you may see some familiar faces among your in-flight crew. 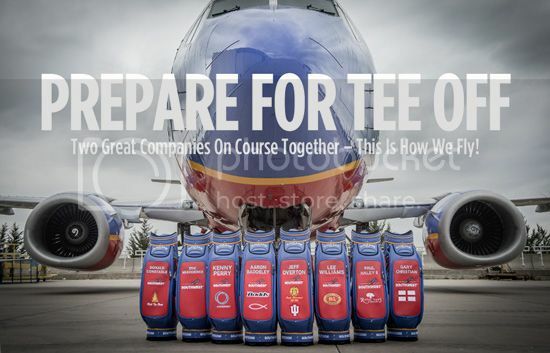 Adams Golf's team of PGA Tour endorsers will be trading places with Southwest employees today making boarding announcements, unloading baggages and according to this blog post even guiding aircraft on the tarmac. It's all part of an innovative new brand partnership between the Dallas-based Southwest Airlines and the Plano-based golf club manufacturer. Throughout the 2013 PGA Tour season, the Adams-Southwest Tour Team will include Aaron Baddeley, Jeff Overton, Kenny Perry, Lee Williams, Eric Meierdierks, Paul Haley II, Donald Constable and Gary Christian. Each player will carry a colorful co-branded Tour Staff Bag, Adams-Southwest Airlines headcovers and wear a new red/blue co-branded Southwest Airlines-Adams Tour hat at select PGA Tour events. "We have always carried lots of golfers, probably more than anybody, on leisure trips, primarily because of our historically low fares and highlighted by the fact that golf bags fly free," Southwest Airlines SVP David Ridley told GolfWeek. "But we're trying to communicate to the golfing community that you need to think about Southwest for business purposes as well." For it's part, Adams will fly free on Southwest Airlines' considerable media budget as the clubs and players will be featured prominently in an upcoming Southwest ad campaign. Seems like a win-win for two challenger brands with not too dissimilar demographics.